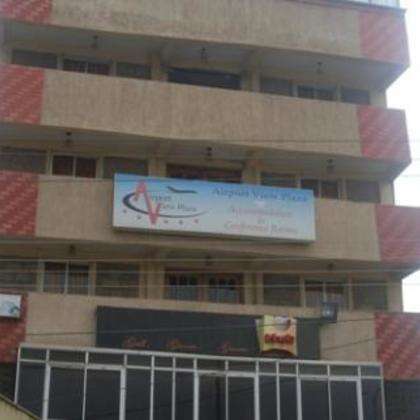 Airport View Plaza Hotel is a budget hotel and accommodation facility conveniently situated along The Airport North Road, just next to The Jomo Kenyatta International Airport, making it ideal for travelers with a flight. Only 5km from the city center, the hotel's strategic location ensures that guests can access the Southern By-Pass, Mombasa Highway, and the Eastern Gate of the Nairobi National Park. Take advantage of a wealth of unrivaled services and amenities at this Nairobi hotel. A selection of top-class facilities such as tours, business center, disabled facilities, shuttle service, and safety deposit boxes can be enjoyed at the hotel. All 57 guestrooms feature thoughtful amenities to ensure an unparalleled sense of comfort. The hotel's host of recreational offerings ensures you have plenty to do during your stay. Guests can enjoy a restaurant/bar, gymnasium, and saloon. The hotel's host of recreational offerings ensures you have plenty to do during your stay. Discover an engaging blend of professional service and a wide array of features at Airport View Plaza Hotel. just next to The Jomo Kenyatta International Airport, making it ideal for travelers with a flight. Only 5km from the city center, the hotel's strategic location ensures that guests can access the Southern By-Pass, Mombasa Highway, and the Eastern Gate of the Nairobi National Park. if cancelled 24 hour prior to check in date 25% of the first night will be charged. if cancelled 12 hours prior to check in date50% of the first night will be charged. if cancelled 6 hours prior to check in time 100% of the first night will be charged.